Get ready for a growth spurt. In the next few weeks, your baby will double his weight and add inches to his length. Right now, he is about the size of an avacado 4 1/2 inches long (head to rump) and 3 1/2 ounces. His legs are much more developed, his his head is more erect than it has been, and his eyes have moved closer to the front of his head. His ears are close to their final position, too. The patterning of his scalp has begun, though his locks aren't recognizable yet. He's even started growing toenails. And there's a lot happening inside as well. 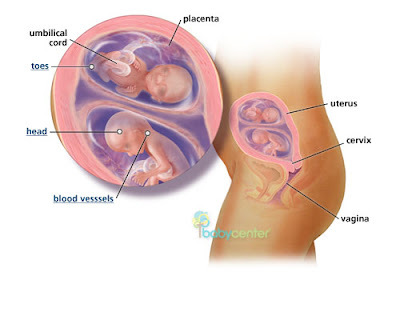 For example, his heart is now pumping about 25 quarts of blood each day, and this amount will continue to increase as your baby continues to develop. Im still feeling pretty yucky. The doctors say that I will deliver about a month early, so that means that we are half way there! I will give you a belly shot soon. I should start feeling them move in the next couple of weeks. I can't wait! Hi Katie- It's is Katie Reid. Congrats on twins- how exciting! Just wanted to say "hi"...I didn't get a chance to read all your blog, but are you guys in texas? Where is texas? We have an interview at a camp near Dallas in Jan...just wondered if it was nearby. :) Take care!